Welcome to Hurricane Riders Club forum, Guest! Hurricane Riders Club forum is a nice place for discussions related to motorcycles specifically for our brand of motorcycle which is the Yamaguchi Hurricane 150 and alike. Here our members share and help each other by posting what they've learned from other members. We usually give advices on various issues regarding our ride. To know more about Hurricane Riders Club, visit the About Us page. At the moment, you are viewing the Hurricane Riders Club forum as a guest. As a guest you can't make post and participate in discussions. You need to register and become a member of the forum. Click the register link below and become a part of us. » Want to Win A Limited Edition HRC Shirt? » HURRICANE RIDERS SIGHTED AT PETRON TAGAYTAY!! » Ride Report: Hurricane Riders Goes to Marine Base Beach Resort! » HURRICANE RIDERS GOES TO MARINE BASE (CAMP KATUNGKULAN)!! The MotoGP series visited the newly designed Silverstone circuit in England this weekend, and Jorge Lorenzo (Yamaha) came away with the win ahead of Andrea Dovizioso (Honda) in second and Ben Spies (Yamaha) in third. Lorenzo lengthens his points lead in the series. World Superbike privateer team of 2009 will not be competing in the 2010 Season. The Stiggy Honda racing team announced it will not compete in either the World Superbike or Supersport Championships in 2010. The team cited economic difficulties as the reason for its withdrawal. Named for its owner, former Grand Prix racer Johan Stigefelt, the Stiggy Racing team has been a constant in the World Supersport paddock since 2005. After earning its best overall result in 2008, Stiggy Racing opted to compete in both the World Supersport and Superbike classes in 2009. Racing for Stiggy Honda, Leon Haslam was the highest placing privateer racer, finishing sixth in the Championship, right between factory Hannspree Ten Kate Honda racers Jonathan Rea and Carlos Checa. During the season, Stiggy Honda also employed American racers John Hopkins and Jake Zemke, and Italian racer Roberto Rolfo. Their combined efforts placed Stiggy fifth overall in the team standings. Stiggy Racing’s Supersport team had equal success in 2009, finishing fifth overall on the strength of riders Anthony West (seventh) and Gianluca Vizziello (18th). For the 2010 model year, Italian motorcycle manufacturer Aprilia will be introducing the RSV4R superbike—a more affordable option based on the Aprilia RSV4 Factory. The machine will feature the exact same high-tech powertrain, including the liquid-cooled 999cc V-Four engine, 6-speed cassette-style transmission, and cable-actuated clutch with slipper functionality. This compact engine features Aprilia’s latest generation ride-by-wire engine management system, DOHC, twin fuel injectors per cylinder, 16-valves, and a 14,100 rpm redline. The RSV4R will, however, utilize different chassis components. Most notably the twin-spar aluminum frame will not offer any form of adjustment, and the Ohlins suspension components will be substituted with a 43mm inverted Showa fork, Sachs gas charged rear shock absorber, and steering damper. The suspension will still offer independent spring preload, compression and rebound damping. Other differences include the construction method of the aluminum wheels, less carbon fiber parts, and a switch from Pirelli to Metzeler tires. The RSV4R will still retain the Factory’s planet-stopping Brembo braking components. HURRICANE RIDERS SIGHTED AT PETRON TAGAYTAY!! 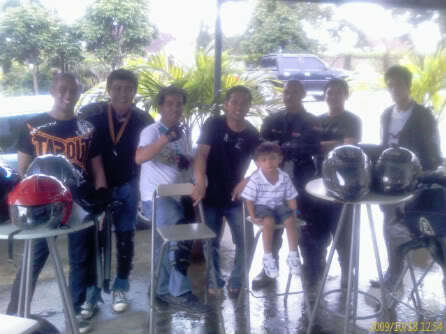 A group of Hurricane Riders was sighted at Petron Tagaytay last Otober 18, 2009. The group was led by Sir Allan aka Sum up, together with James aka Kalel, Bicutan, Sir Manny, 2lisan, Killua and their new found member Jim. The group says it was only a quickie ride. I had a little chitchat with them before deciding to go home. It's always fun to be with the group. (i just hope that I will have my Hurricane again soon). Thanks for the nice chat sirs and to all Hurricane Riders, Keep on Riding!! Valentino Rossi has become only the second rider in motogp history to reach 100 wins with a measured victory at Assen on Saturday. The Doctor as he was fondly called, who made his 125cc grand prix debut in 1996, took the chequered flag first for the 100th time by 5.368sec in front of Jorge Lorenzo. Rossi celebrated his historic victory, and third win of the season, with a one-handed wheelie before meeting his waiting fan club for a special celebration. Rossi unfurled a huge poster which featured a picture of every single one of his 100 victories, starting with Brno in 1996. At the end of the poster was a huge number 100 and Rossi was then given a flag bearing that number to carry for the remainder of the slow down lap, cheered on by the 96,000 fans. 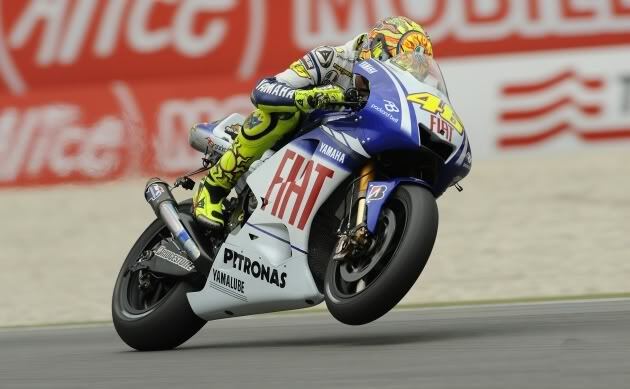 Rossi’s 100 grand prix wins are divided 74 (500cc/MotoGP), 14 (250cc) and 12 (125cc) and he is now five points clear of Lorenzo in the 2009 world championship. The only other rider to claim 100 grand prix wins is fellow Italian Giacomo Agostini, a winner of 122 races in all classes. Rossi already holds the all-time record for premier-class race wins. motorcade will be done at the North Luzon Expressway on May 8, 2009. As mandated, NLEX will be open not only to big bikes but also to scooters and underbones to allow them to join the biggest gathering of motorcycle riders and enthusiasts in the country. It is to set a new historic record for Philippines Motorcyclist by setting a record in Guinness World Records if possible. With Her Excellency - President Gloria Macapagal-Arroyo as guest speaker, host clubs Lawin Motorcyclists Club, Inc. and Vigan Heritage will lead the flag-off at Camp Crame going to NLEX Sta. Rita all the way to Clark Field, Pampanga. The parade will be a joint project of all motorcycle federations and organizations in the country. All motorcycle riders and enthusiasts are urge to join this event. Be one and unite to ride in saving the environment. We only have one place to live no matter what type of motorcycle you ride and what club you're in. HURRICANE RIDERS GOES TO MARINE BASE (CAMP KATUNGKULAN)!! The Hurricane Riders Club will be having their 2nd Ride of the Year on February 22, 2009. This is expected to be one enjoyable day of ride, bonding and nature tripping as well for the whole group. The Marine Base Camp is located near Puerto Azul and Caylabne Resorts. All in the beautiful Town of Ternate in the Province of Cavite. North Boys from QC and other places-Just keep posted here. After their first two editions of the successful and well attended event, they are moving to a new and better venue at the fully air-conditioned Mega Tent in Pasig City. With an indoor space of 2,100 sqms, it is located along Meralco Avenue,Pasig City, it's very accessible and easy to find.